Floor Scrub Helps Keep Your Facility Looking Its Best. High-Quality Construction Supports Your Cleaning Crew So They Can Deliver Top-Notch Results. Use This Rugged Brush For The Most Challenging Of Scrubbing Applications. Plastic Blocks Resist Splitting Or Delaminating. Long-Lasting Polypropylene Fibers Resist Stains And Offer Good Abrasion-Resistance And Shear/Break Strength. Very Durable Bristles Will Not Stain, Discolor Or Absorb Odors. They Are Resistant To Solvents, Acids, Oils, Fungus And Bacteria Growth. Handles Sold Separately..
7920002822470 "9" Crown Point Hand Scrub"
Floor Scrub Helps Keep Your Facility Looking Its Best. High-Quality Construction Supports Your Cleaning Crew So They Can Deliver Top-Notch Results. 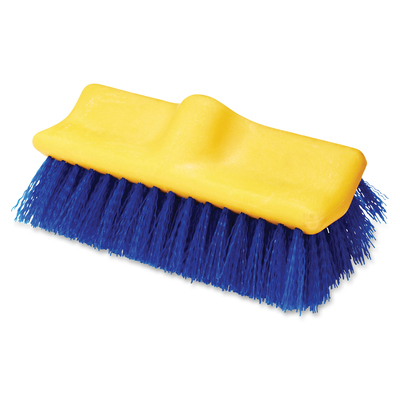 Use This Rugged Brush For The Most Challenging Of Scrubbing Applications. Plastic Blocks Resist Splitting Or Delaminating. Long-Lasting Polypropylene Fibers Resist Stains And Offer Good Abrasion-Resistance And Shear/Break Strength. Very Durable Bristles Will Not Stain, Discolor Or Absorb Odors. They Are Resistant To Solvents, Acids, Oils, Fungus And Bacteria Growth. Handles Sold Separately.